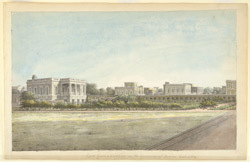 Watercolour of the view from a window in Government House at Calcutta by Hubert Cornish (1757-1823) dating from 1793-98. The house on the left appears to be situated in the grounds of Old Government House, on the corner of Wheler Place and Old Court House Street. It is visible in William Baillie's view of Government House published in 1794 but was pulled down in the clearances for the building of new Government House. The foundation stone of the new Government House was laid in 1799. The house at the extreme right is the last on the east side of Old Court House street and was described by William Hickey as a school.